Angel trumpet is a tropical tree native to South America. It can grow up to 25 feet in height and produces large flowers between 4 and 24 inches in length that resemble trumpets, hence the name. 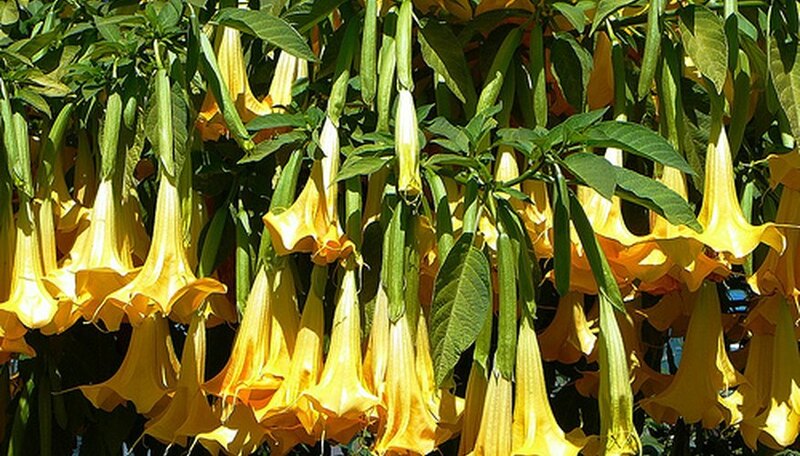 All parts of the angel trumpet plant are highly toxic and should not be planted near children or animals. Angel trumpet is most easily grown from a sapling, which can be purchased from plant nurseries, and can flourish with only routine watering and pruning. Choose a location for angel trumpets that is sheltered from the wind. Always plant in the early spring, following the final frost of winter. Ensure that the planting location receives full sun and that the soil is well drained. Spread a 2-10-6 NPK fertilizer over the location prior to planting, and then water generously to release the nutrients into the soil. Dig a hole twice as wide and of equal depth of the root ball of the angel trumpet. Transfer the angel trumpet plant into the hole and gently refill with soil. Water thoroughly to compact the soil and bring the moisture into contact with the roots. Continue watering twice a week until the plant is established. Reduce to one deep watering per week and only on weeks without significant rainfall. Feed angel trumpet plants using a 6-10-4 NPK fertilizer once a year, just before growth begins in the spring. Wait several hours after applying, and then water deeply to integrate the fertilizer into the soil. Follow the manufacturer's directions for proper dosage. Begin pruning after the trunk forms a "Y" shape. Prune all old and dying branches back to 4 feet in length to encourage flower formation and the growth of new branches. Flowers will form at the terminated end of the pruned branches. Mulch can be spread around the trunk of the angel trumpet to conserve moisture and reduce weeds, which will compete for nutrients. Only water once per month in winter when the tree has gone dormant. Always wear latex gloves while pruning angel trumpets and thoroughly wash your hands after handling any part of the plant. It is toxic and should never be ingested.